The series gets even better with the second DVD of this pulse pounding car series. After the introductory sequences of the first disc, this time we are able to get into the actual car racing side of things a little bit more than last time. I love this series and this disc reinforced that feeling. Add to that the fact that my wife also loved it and that is saying a lot for the show. She's into anime but it has to be pretty darn good for her to take notice. 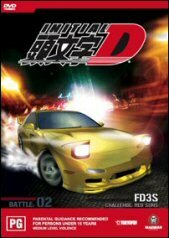 Initial D mixes traditional cel drawn techniques for the main parts of the story involving people and conversations and then uses computer graphics for the car scenes that look amazingly good. From the last disc, it's discovered that Tak Fujiwara is actually the driver of the Eight-Six that they are all so in awe of and it takes Tak beating KT of the Akagi Red Suns for everyone to believe it was really him. Bunta, Tak's father was meant to drive, however he sent his son to take his place. Tak still couldn't care about the racing, he just wanted the tank full of gas his father promised if he won! He just wants to take Natalie to the beach! As per last DVD, car racing is talked about with almost a mysticism that does border on the hilarious and on one scene we are told that when man and car are truly together they leave an aura, I laughed out loud. It's kinda hokey to the point of being very very cool. Act 4: Into the Battle! The pacing of this disc is perfect with each episode ending on a cliffhanger that makes you hit the enter button on your remote to get to the next one quickly. The storyline has a great flow to it that will keep your interest the whole way through. We are starting to get to know more about the players in this story and can't wait to find out if Tak will actually get enthused about the high speeds he is capable of driving at. The disc is shown in 4:3 full screen and there are no video problems with the disc at all. The way that we are shown the car sequences is fantastic and the effects really suit what you see on the screen. The discs menu system is easy to navigate and very functional. You have a choice here of Dolby Digital 5.1 surround in both Japanese and English audio. With some anime, I prefer to listen to it in Japanese and deal with the subtitles, however this was good enough to concentrate on the movie and listen to the English version. Sounds are crisp and clear throughout and we are treated to some rocking tunes throughout every episode including a pumping title song. I wasn't that impressed with the extras on this disc, however car nuts will be pleased with Showroom #2 section that shows you how to do certain moves in your car. There is also the option to watch the movie in it's original Japanese or enhanced English version.